Whether you are one of the iOS faithful or not, anything hitting the net waves concerning new Apple gear draws quite a bit of interest, none more so that the next generation iPhone and next generation iPad, and now it appears that parts for the iPhone 5 and Apple iPad 3 have surfaced. According to the guys over at 9to5 Mac by way of Macpost, said parts have shown up on SW-Box, and are apparently the Apple iPad 3 Power on/off Flex Cable Switch Replacement, and the iPhone 5 Proximity sensor. 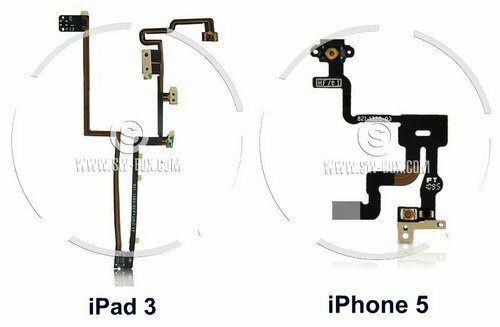 According to the article the guys over at iFixYouri have taken a look at the Apple iPad 3 Power on/off Flex Cable Switch Replacement and says that the materials used in these purported new parts are the same as used in the Apple iPad 2, however the location of switched and structure are different. The iPhone 5 proximity sensor part was tweeted by @Chronic, again found on SW-Box, and the website has also posted a video to YouTube showing off the iPhone 5 part compared to the same part for the iPhone 4, however the guy in the video, which can be seen below does state he isn’t 100 percent sure it is for the iPhone 5. Thus one can only presume that this is a guess because supposed iPhone 5 and Apple iPad 3 parts haven’t been seen before, and obviously no one is coming forward to confirm that they are indeed parts for the next generation iPhone and iPad, so for now this again rests in the land of speculation, but hey, the parts have to come from somewhere right? Anyway, sooner or later the iPhone 5 will release, whether it will include this latest part remains to be seen and the same goes for the Apple iPad 3, so until then you can head on down and mash that play button to check out the footage, and feel free to let us know if you think these are actual parts for Apple’s latest tech gear. that merchandise imported from China has been checked and certified at source. re-confirmed 100% upon quotation, as they vary on a daily basis. lists such as iPad, iPod etc.